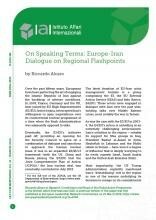 Riccardo Alcaro, On Speaking Terms: Europe-Iran Dialogue on Regi onal Flashpoints, IAI Commentaries, 19:21, IAI, March 2019. Over the past fifteen years, Europeans have been perfecting the art of engaging the Islamic Republic of Iran against the backdrop of adverse conditions. In 2003, France, Germany and the UK, later joined by EU High Representative (E3/EU) Javier Solana, intercepted Iran’s willingness to open negotiations over its controversial nuclear programme at a time when the Bush Administration was adamantly opposed to talks. Eventually, the E3/EU’s initiative paid off, providing an opening for the Security Council to agree on a combination of dialogue and sanctions to approach the Iranian nuclear issue. It was in an expanded E3/EU+3 framework (with the US, China and Russia joining the E3/EU) that the Joint Comprehensive Plan of Action(JCPOA), the Iran nuclear deal, was eventually concluded in July 2015.